We are excited to announce that we have one litter bred and a second breeding soon to come! 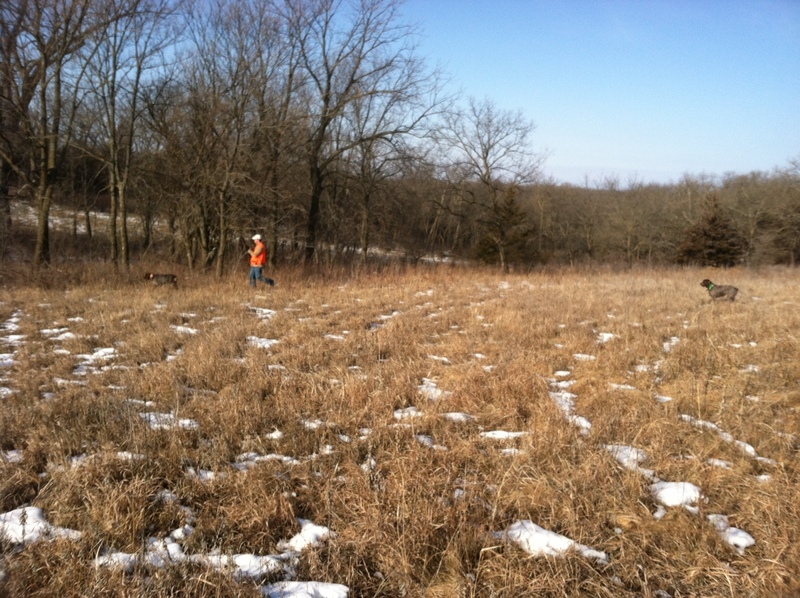 I noticed Sue’s proestrous (bleeding) on our short hunt in the Sandhills on the Sunday before Christmas. Breeding took place between December 27th and New Year’s Eve, so we’re looking at a March 1stish whelping and May 1stish homegoing for Sam and Sue’s 2013 litter. Mae’s proestrous was noted on Saturday and she is not yet ready to breed, but it will be any day now (if I had to guess it would be within the next 2-7 days). So, that’s approximately a March 15thish whelping and a May 15thish homegoing. It will be a very busy spring here with two litters on the ground at once, but we can’t wait! We finally had a good dose of snow right before school let out for Christmas break, but when I went to photograph the dogs and kids in the fresh snow, my camera’s battery went dead. I was able to get some good shots of everyone on Sunday, finally. Four dog romp: Sue on top right, Sam bottom left, BB’s head and Mae’s hindquarters. 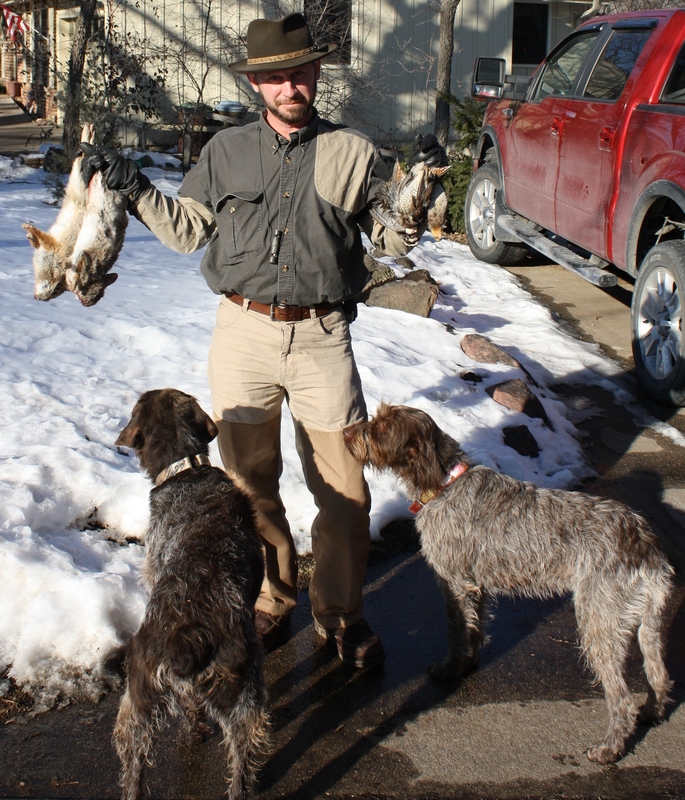 Wirehaired Pointing Griffons. 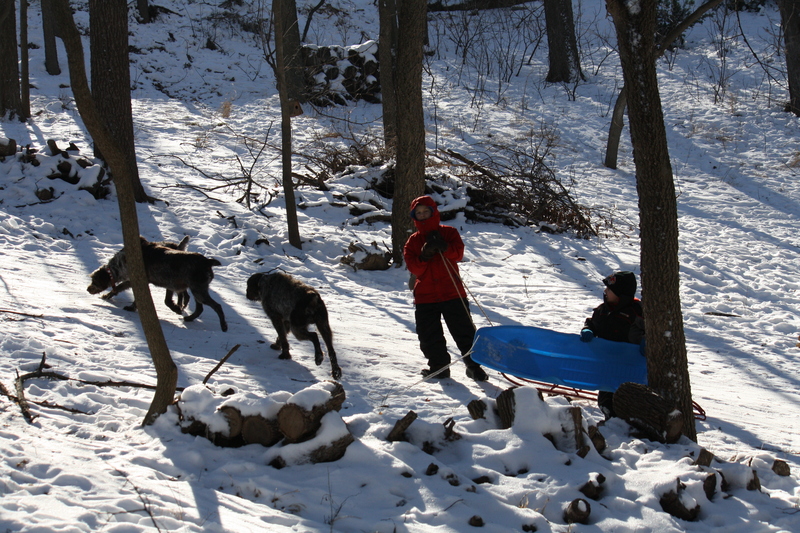 Mae, Sue and Sam with Conrad and Caleb on the sled hill. 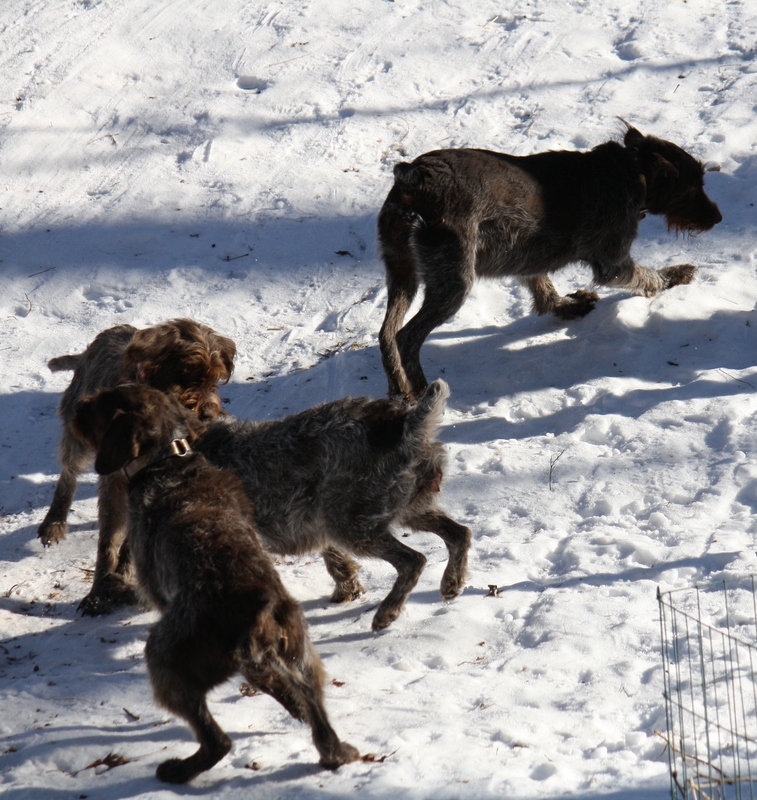 Wirehaired Pointing Griffons. Sam’s girlfriends having a serious conversation. 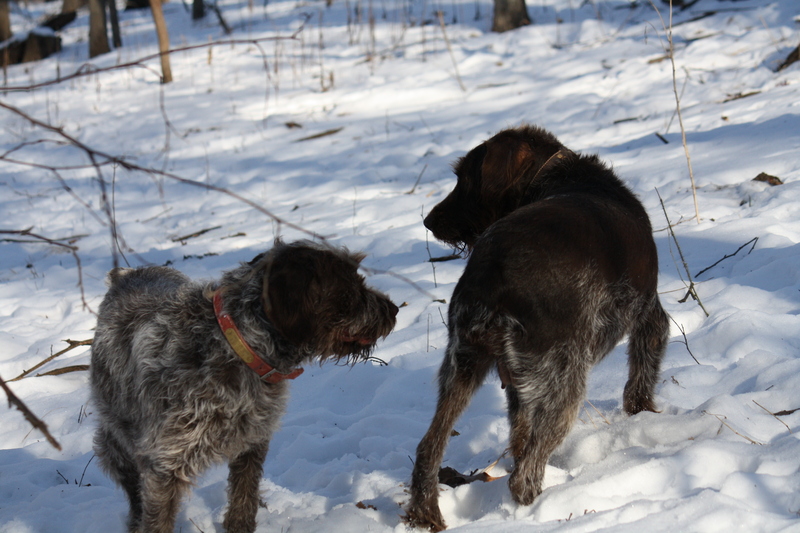 Mae on left, Sue on right, Wirehaired Pointing Griffons. Sue on the sniff and already looking paunchy 2 weeks pregnant. 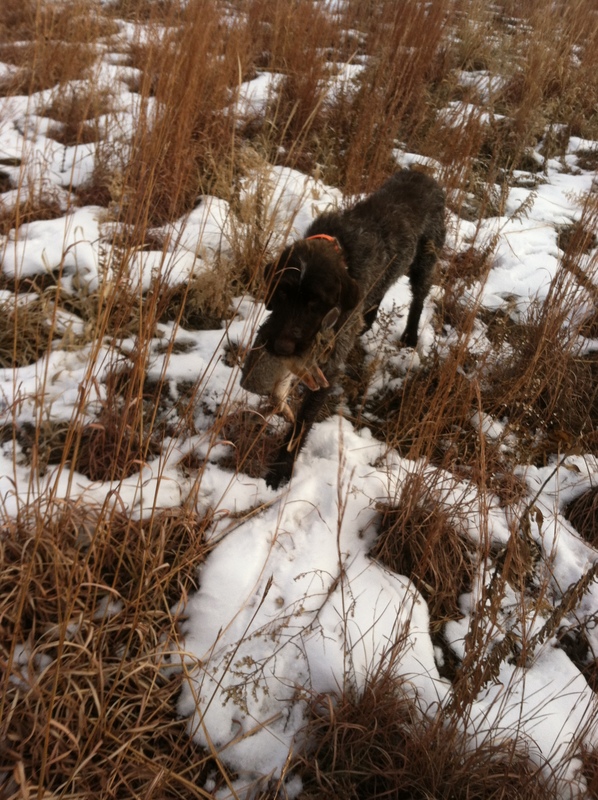 Wirehaired Pointing Griffon. Mae having a big run down the hill. 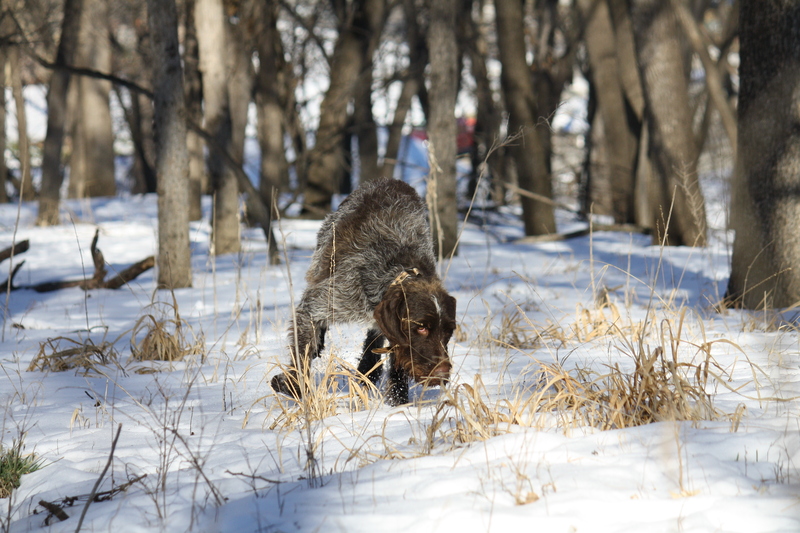 Wirehaired Pointing Griffon. BB also had a good run. 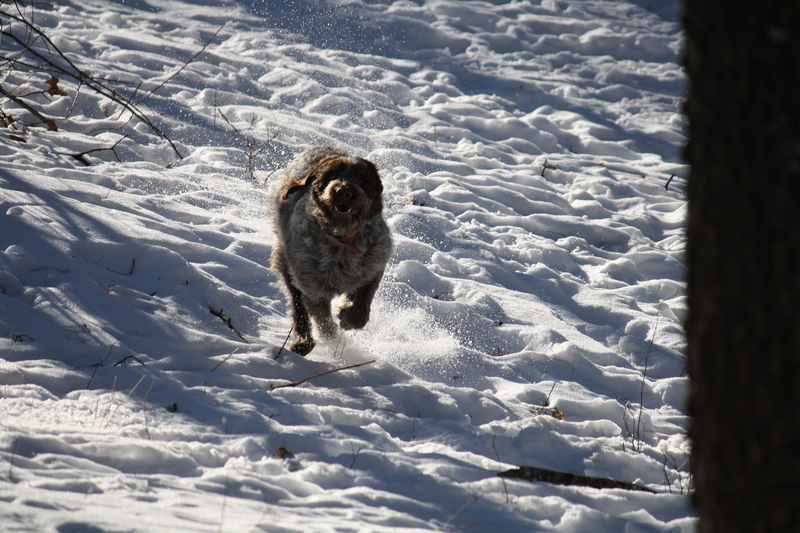 Wirehaired Pointing Griffon. Big daddy Sam looking quite serious. 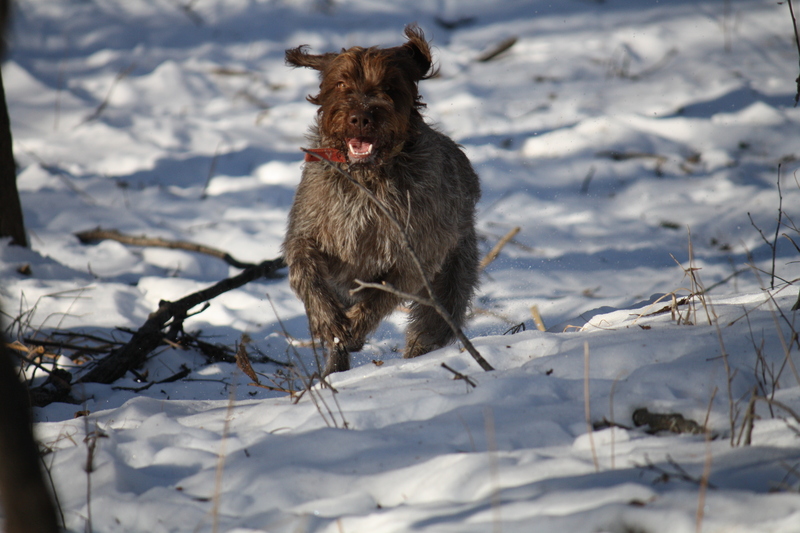 Wirehaired Pointing Griffon. After some fruitless tries at hunting pheasant in Southeastern Nebraska and Northeastern Kansas, Charles and Matt hit a few quail spots last weekend with some success. I’ll eventually get a full hunting blog post out on it, but I wanted to share these photos. Sam retrieving a cottontail rabbit. Photo by Charles. The folks I went grouse hunting with finally sent some pictures. Here is Abby with the birds she helped harvest. She pointed one of the woodcock and flushed one of the grouse. She retrieved both to my general location. Her registered name is Bluestem’s Quail Hammering Abby. 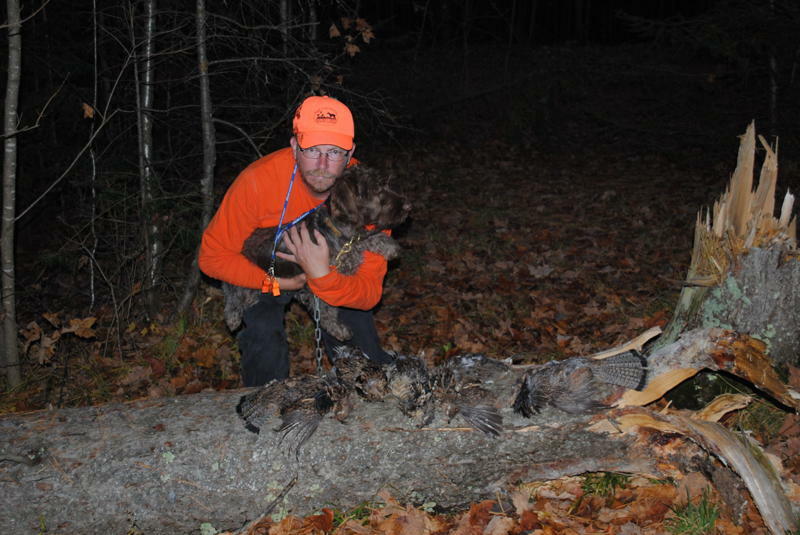 Rob and Abby (from Bluestem Kennels “D” litter from Sam and Sue, 5 mo old female Wirehaired Pointing Griffon female) after a successful October day of hunting ruffed grouse and woodcock in Wisconsin. 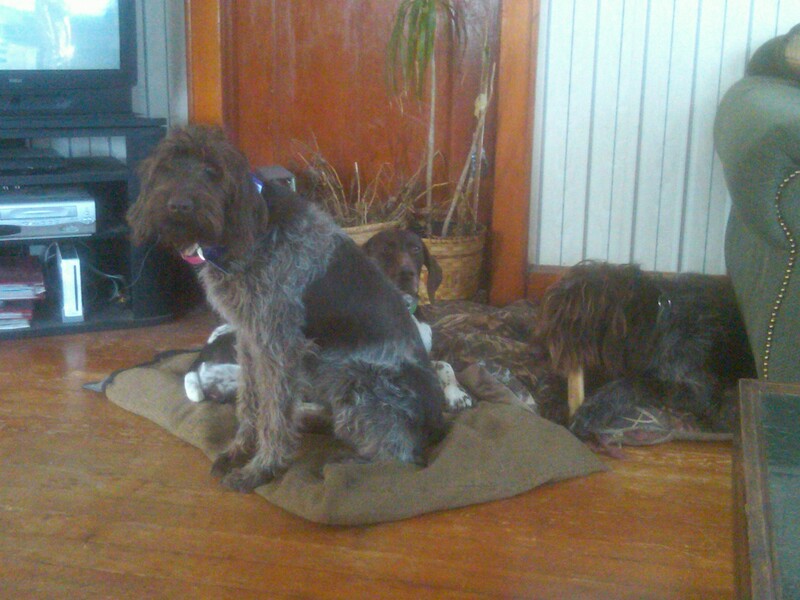 Abby (7 mo old female Wirehaired Pointing Griffon) on left, hanging out with Ruby the GSP and fellow griff, Ace. Abby’s brother, Gomer, lives in Central Illinois with Kyle and Jenna. He will be heading to Tom Dokken’s Oak Ridge Kennels (http://www.dokkensoakridgekennels.com/) for training soon and appears to be enjoying a great life! 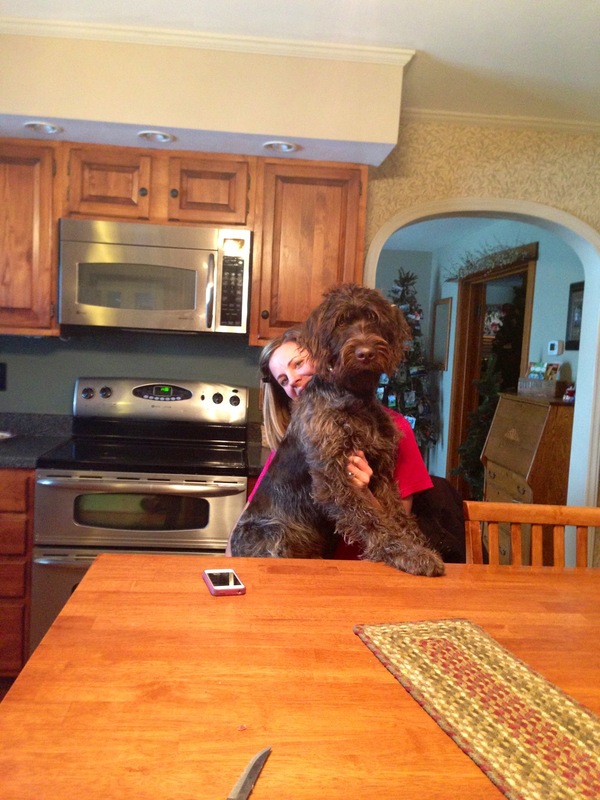 Gomer (7 mo old male Wirehaired Pointing Griffon) and Jenna are ready for a snack. 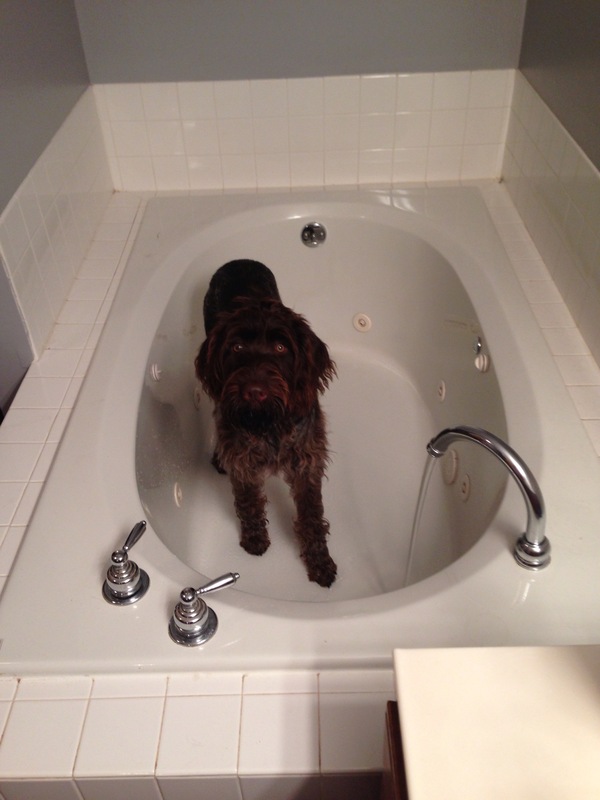 Gomer (7 mo old male Wirehaired Pointing Griffon) is ready for a bath. 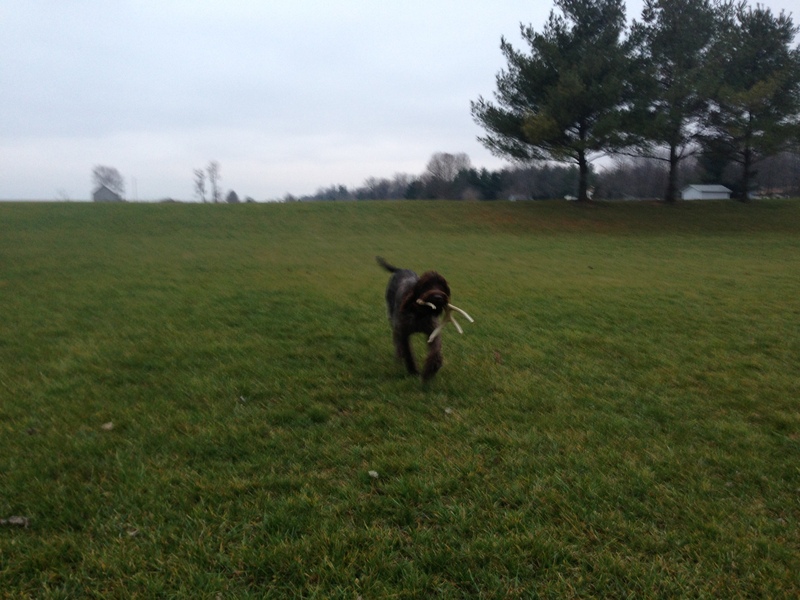 Gomer (7 mo old male Wirehaired Pointing Griffon) fetching up a shed deer antler. 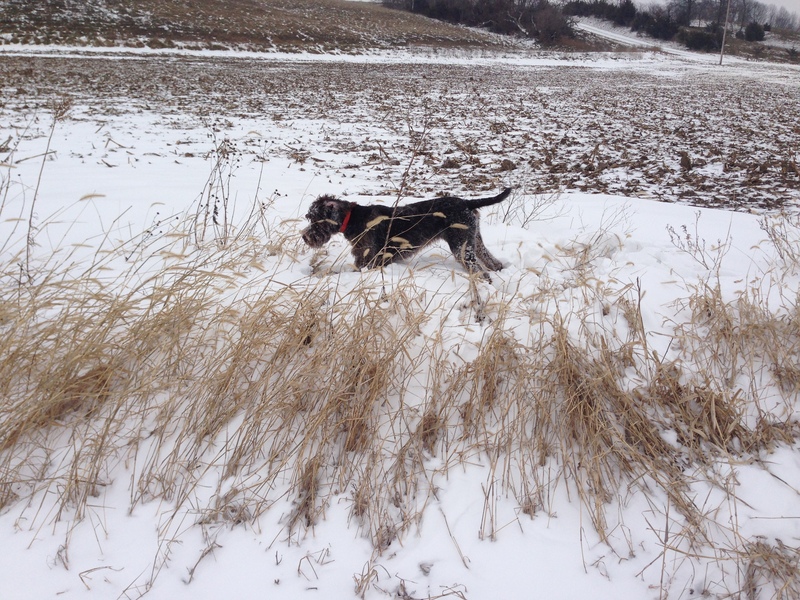 Gomer (7 mo old male Wirehaired Pointing Griffon) on point in the snow. We received a Christmas card from Rick’s family who lives just a few miles east of us and 10 month old Dottie (from our 2012 “C” litter from Sam and Mae) was featured, sporting some holiday cheer. 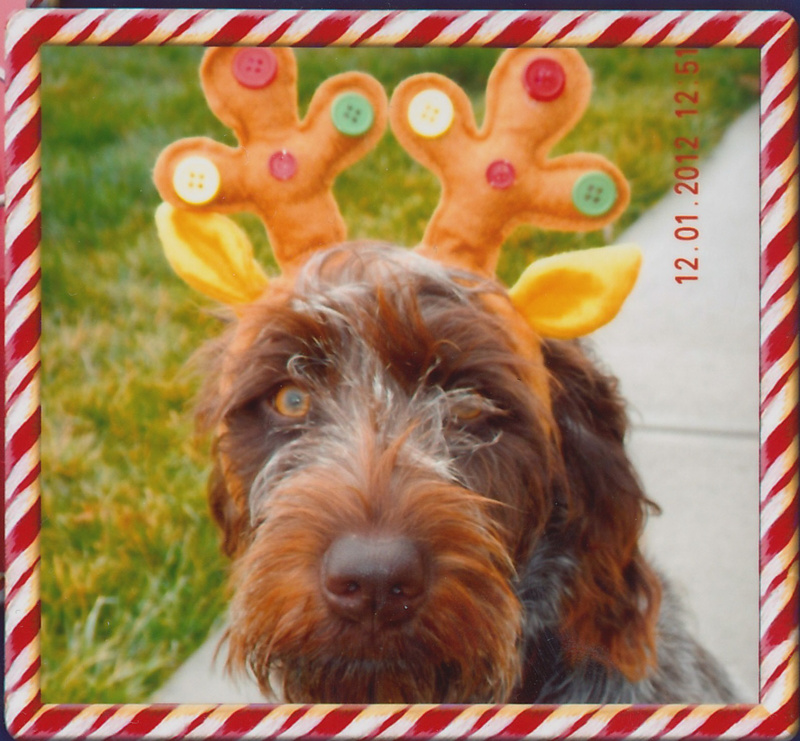 Dottie (10 mo old female Wirehaired Pointing Griffon) had a Merry Griffmas! 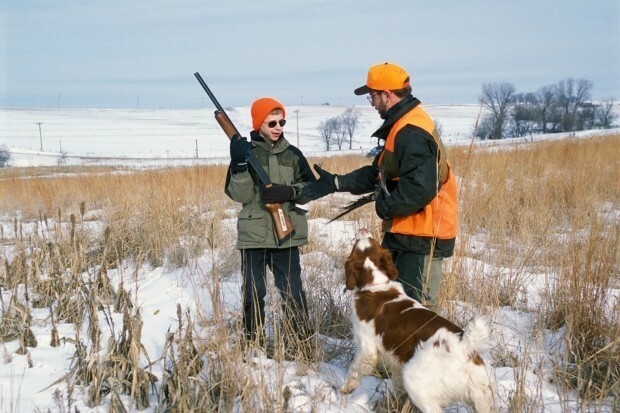 Dottie’s sister in North Dakota, TracHer, has been having a great pheasant season with Susan and Tom! Here she is lugging around a big North Dakota rooster, good girl!!! 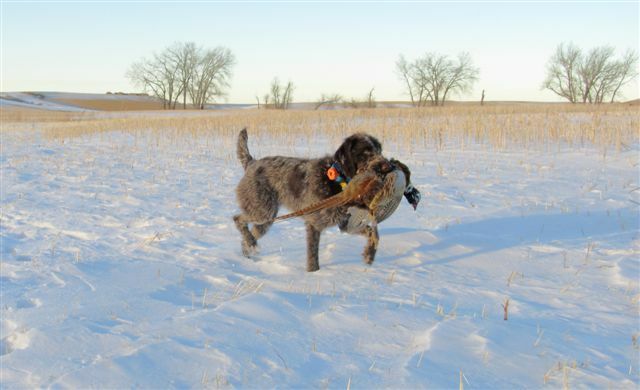 TracHer (10 mo old female Wirehaired Pointing Griffon) retrieves a big boy from North Dakota! 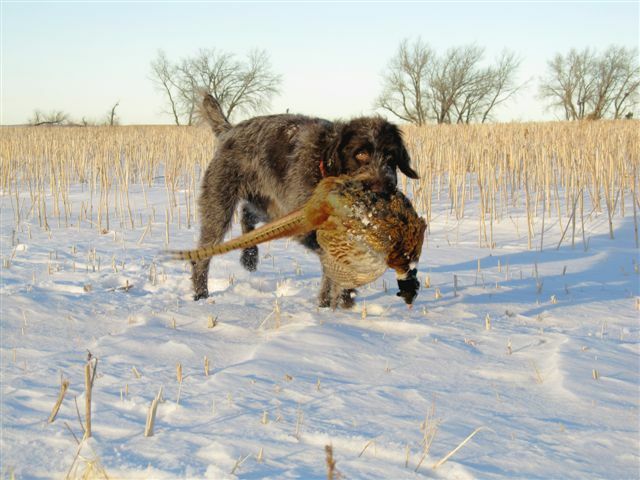 Another shot of TracHer (10 mo old Wirehaired Pointing Griffon) and the North Dakota rooster. There’s nothing like the North Dakota prairie. 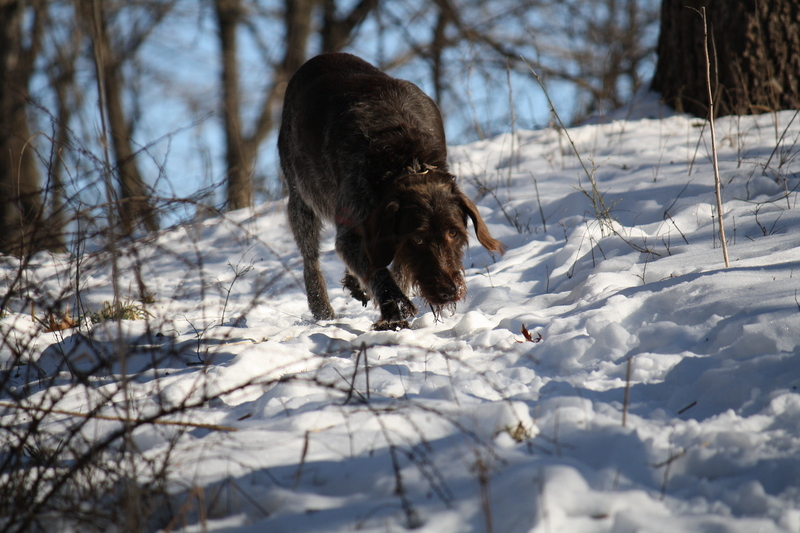 TracHer (10 month old female Wirehaired Pointing Griffon) in her element. A huge thanks (as always) to everyone who contributed photos to the blog. 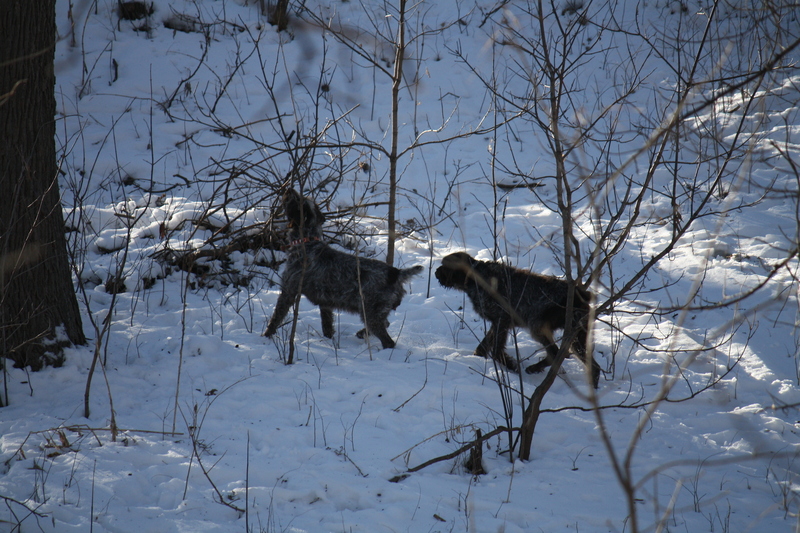 We’ll be sure to keep you posted on the breeding of the second litter and any end-of-hunting season adventures. Until then, stay warm and enjoy the extra moments of daylight we’ve been getting in the great outdoors!